It’s good to be unimportant and watch time sweep back, to repeat to Joe, not five, that he’s not going to die; and not think about our own reasonably closer hour. It’s good to stride into the slap of winter and let thoughts wander. This cold helps the harvest of the Brussels sprout, cousin to the cabbage with its whorl of green that is a body and a bud. I relish the bitter taste. The greengrocer insists, After Christmas no one wants sprouts. As it ages, the bud ruffles around the edges and turns jaundice yellow. Brian, who died last week, won’t be buried until after Christmas. Joe wants marmalade and butter on two toasts. I’m going to steam my sprouts. Through the window, a crust of frost. Joan Michelson’s recent poetry book publications: The Family Kitchen, The Finishing Line Press, USA, 2018, Landing Stage, prize publication, SPM Publishers UK, 2017, Bloomvale Home, Original Plus Chapbooks, UK, 2016. Toward The Heliopause, Poetic Matrix Press, USA 2011. Her writing has been selected for British Council and Arts Council anthologies of New Writing. Originally from New England, Joan lives in London, England. Photographer’s Note: The image of Brussels sprouts to illustrate this poem was used for obvious reasons. This piece is clever with it’s simple but strong symbolism of the life span and usefulness of sprouts before they begin to wither, die, and go unnoticed as their season ends. 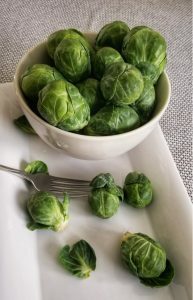 I paired the poem with a basic photo of fresh, everyday Brussels sprouts. They are in their prime, still looking healthy and vibrant and “living in the present”, before they spoil or are cooked, surely knowing the time for either will come.